The release of Game Maker 8. Chrome support for Instant Play (or even better a Java launcher version for all browsers currently not supported). 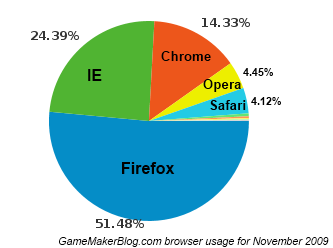 When I can play Game Maker games in my preferred browser at YoYoGames.com I will, if I can’t I will either continue to resent loading Firefox or go elsewhere. An announcement of what is coming next both at YoYoGames.com and for the Game Maker software. The software on your sites to be kept up to date so that links to pharmacies are not inserted into your blog and the GMC remains secure. What do you want from YoYo Games and Game Maker for Christmas/New Year/the future? No, Not an online registration. I want the same registration system that GM6 And GM5 Had. That one is the best. @Unkown and the easiest to use illegally. Well I’ve had no problems with Softwrap, actually. But I know there are a lot who have. @Sandy By using Softwrap could you remove the three-activations-only thing? I’m well aware it would increase piracy rates. However, at the same time, it’s what’s been bugging people that have willingly paid for the software. For example – I’ve had to reinstall my OS four times this year. The first two were okay, I could reactivate it. The third time was alright – Softwrap were quick (under 24 hours) to respond. But the fourth time, YYG (may have even been you) said Softwrap had lost the email. I lost two weeks of owning GM Pro before you guys had to reactivate it instead. Those two weeks were part of a four-week contest, which pretty much destroyed my chances in it. That’s what I don’t like about Softwrap AS IT STANDS IN GM7 – it’s a piece of DRM that’s a pain to paying customers. If you could either remove the activation limits, add a “Disactivate this copy of Pro” button (though it wouldn’t help with crashes), or make it so a registration will automatically undo itself after, say, a month of GM not being used, then I would support it in GM8. If not (and pointing out you’ve already said in the YYG glog Softwrap is gone) I’ll wait until 2010. @Sandy Is that a serious choice between GM8 this year with Softwrap or next year without? @nal I’m going to show that to my kids. Chrome support is on the way, so is GM8, (I hope). Is Softwrap REALLY that bad ?… if we use Softwrap for GM 8 I might be able to get it released in 2009 ? VERY close to being able to talk about our new dev team and our new ofice and what they’re going to do to GM in 2010, but you’ll need to wait until January to hear about it ! I’d like YoYo Games to deliever all those promises they made. What happened to the online highscores? And what about the possibility to sell games? GM8 in 2009? What about competitions, or that secret surprise alternative? GM Mac? – oh yeah, their Mac guy resigned. Nice pic of Father Sandy. Somebody should show him that picture. @NAL +1 GMB Point. I think that makes you joint leader. @NAL Awesome pic. And I too would like to hear about contests. Fingers crossed they have something planned for the GM8 and the YoYo relaunch. Agree big time on number four. I like Instant Play but I like Chrome a lot more. Number six is the main thing I’d like to see across the board. I’d say make it a New Year’s Resolution but nobody keeps those. On the serious part of the topic, I’d quite like some sort of news of a new YYG contest, even if it has lower/no monetary prizes. They’re fun to participate in and always yield some stunning entries. A GM8 release or at minimum a realistic, meetable release date would also be welcomed, since I’d really like the Alpha-PNG support ASAP. 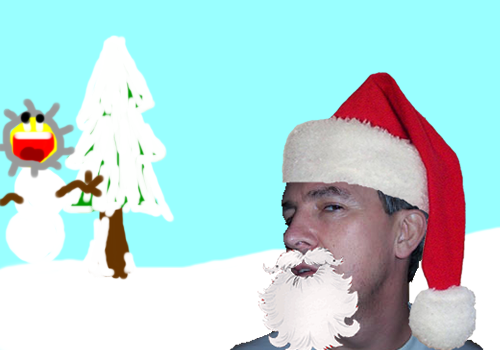 +1 GMB point for the first person to add a decent looking Santa hat and beard to a photo of Sandy. Haha, With the logo in the bg..
Actually Google Chrome supports NPAPI plugins, so it wouldn’t take too long to port their Mozilla Firefox extension to Google Chrome. @NAL Nal, that picture was EPIC.